Peter Gordon talks to Louise Howland, an Australian mother who has invented a new game to improve social skills called TAOC The Art Of Conversation. Jim Mora speaks with Louise Howland about the implications of Technology on our ability to construct meaningful conversations. Louise Howland wants restore quality genuine real conversations. How can we help our children to better communicate with their friends, their teachers and their families? Louise explains to Jacqui the benefits of constructive conversations with our children from a young age. Practising the lost Art of Conversation. with Louise talks with Jacquie Mackay. Leigh Hatcher talks with Ross Bowerman, author of the Art of Christian Conversation card game, explores how to have a great, indepth conversation about faith. Clayton chatted to Ross Bowerman, one of the co-creators of the new game "The Art of Christian Conversation", part of "The Art of Conversation" series. Ross Bowerman and Louise talk Family Conversation with Family Life Australia. Louise talks with Phill Hooper from the radio station Classic Hits in Ashburton, NZ. Louise talks with Stu Taylor on the show "Equity Strategies" on Radio America. US talk show host Stu Taylor interviews Louise. Jim Mora speaks with Louise Howland. Storied Gifts - Interview on American Radio. Hear the TAOC story in this radio interview from America - by Sherry Borzo. .
TAOC, Keith and Louise featured on a segment of Inside Business. .
Light FM morning program. .
Louise talks with Carly and Oliver on the 3 News TV Breakfast program. 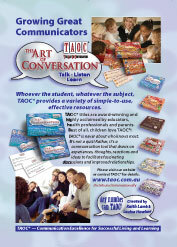 "The Art Of Conversation is an extremely useful and valuable resource"
"Better fun than any Quiz! The only knowledge I needed was my own life"
"More than a game, TAOC makes me think, reminise and enjoy the company of friends and people I had never met before"
- Laurie Patterson, Country Singer/Songwriter. "TAOC gives our family warm, sharing and caring evenings, creating memories which will last a very long time"